If you still have some Christmas shopping to do for the family, you may find some of these ideas useful. I’ve put together some of my favourite gift ideas for a Young Girl, particularly one who loves to learn, and hope it’s useful to you. Me and My World is a lovely educational site if you’ve not come across it before. With three different site areas to choose from, you can select an educational bag from ‘I Want to Be’ – ‘I Want to Explore’ and ‘I’m Learning About’. Each section contains gifts from all kinds of areas to suit both boys and girls. 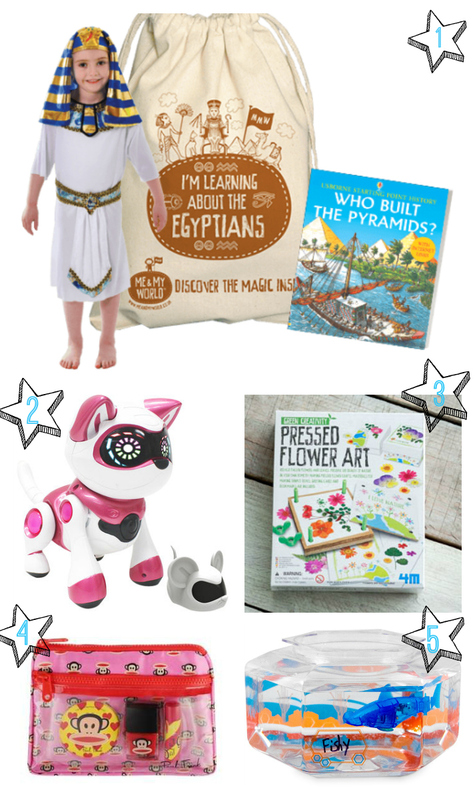 My young girl is going to be learning about Egyptians next term, so I know she’s going to love this learning bag containing a book and dressing up outfit. Just perfect for getting kids involved in education in a fun and interesting way. The bags start at £17.99. For my gadget loving young girl, I’ve decided on this robotic cat as one of her main gifts. I must admit I’d seen some rather negative reviews about the robotic puppy last year so wasn’t too sure this was worth the money. But then I read this great blog review about this very toy, and felt reassured. I think she’s going to love it. You can buy the Teksta Kitty at various places, including ToysRus for around £50-£60. We visited the Eden Project whilst on holiday earlier this year and loved its Eco friendly shop. I remember pressing flowers myself as a child and know she’s going to have loads of fun trying this out. The set comes with everything you need to be able to press your flowers, including greetings cards, bookmarks and trinket boxes to create flower art pieces once you’re done. The Pressed Flower Art kit from the Eden Project costs £10.50. She might be gadget loving, but she’s very much a girly girl, so if yours is like mine, she might like this cute little beauty bag from Paul Frank at Boots. The design is spot on for young girls – fun and fresh, and I know she’ll love keeping her treasures in here. It’s also a great little bag for our travels, plus she’ll have fun with the nail varnish too. These are available at Boots for £12. Suitable for girls or boys but my young girl is going to love this toy! Again, a great tech toy for the younger child, this robotic fish comes complete with its own fishbowl and allows the child to experience looking after their own pet fish. Available in ten translucent colors, the Aquabot 2.0 swimmers are equipped with an inner pulsating LED glow and a hi-tech sensor allowing you to wake the sleeping fish by tapping on the tank. Available from the Hexbug website for £14.99. I hope you like my Young Girl’s Christmas Gift Guide, do let me know if you have any of these gifts for your own younger girl. That hex bug fish is fab – we got them for the boys last year but the tank is a genius idea!